Do you remember the things you loved the most about school during your 1-12th grade years? I had the privilege of attending school in four different countries for those years. I attended K-6th in Jamaica with a short five-month stint in Costa Rica during 5th grade, 7-9th grade in Puerto Rico, and the rest in Walla Walla, WA. My favorite aspect of school was interacting with the other students, especially my close friends. In Jamaica I was one of two or three Caucasian students in quite a large elementary school at what used to be West Indies College. I was called “white pig” a couple of times, but I still had a great time because 99 percent of the students were friendly. 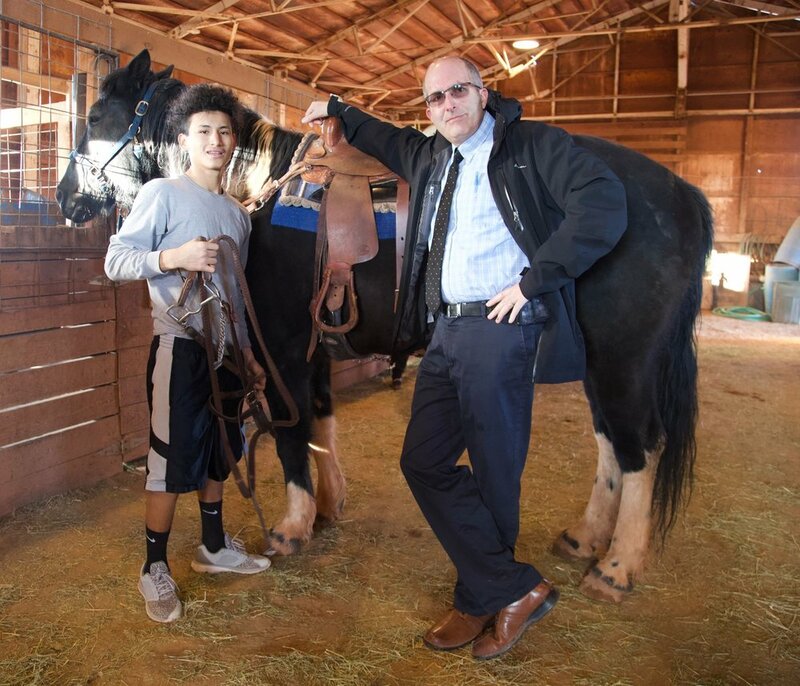 Mr. Ojeda visits Jorge, 11th-grade, at Horsemanship. At Holbrook Indian School (HIS), we believe firmly in holistic education. It is sometimes necessary to dig deeper into concepts and break information down into pieces that students can understand. And to be honest, we do not always get it right. As humans, we sometimes spend too much time on the pieces and parts of concepts instead of the whole concept. One of my jobs as instructional leader at HIS is to ensure that our focus as teachers is balanced. Individualized math and reading programs. Electives: Pottery, graphic arts, photography, woodworking, auto mechanics, welding, gardening, horsemanship, and music appreciation. Movement activities: Athletic program, mountain biking, hiking, and swimming. Our efforts are paying off. For the first time in the six and a half years I have been at HIS, all of the senior class members meet the minimum graduation requirements, and some are well above. This is compared to none or maybe one during my first five years, and 80 percent last school year. As Christian educators, we should not be surprised by the effectiveness of a holistic education—after all, the education principles that God shares with us in the His Word, clarified by Ellen G. White, are definitely holistic. As always, thank you so much for your support. I hope you had an amazing holiday season. Please continue to keep us in your prayers.